With those words, a true American hero rocketed into space fifty years ago, aboard Friendship 7. A decorated Marine pilot, he became the first American to orbit the earth, and gained a permanent place in the minds and hearts of his country. Years later, after a lifetime spent serving his country, he returned to space in 1998 at the age of 77, the oldest man to ever fly in space. When the shuttle Discovery lifted off the pad, we once again heard the iconic words, "Godspeed, John Glenn." Today we offer the story "Godspeed" for free, in honor of a real hero, a man who has lived a life of service and honor, and who has served his country with grace and dignity for more than half a century. This is my tribute to a man I greatly admire. If you prefer to purchase a copy of "Godspeed" for your electronic reader instead of reading it here, it is available for Kindle, Nook, iPad, and for other formats through Smashwords. "Mayday! Mayday! This is Air Force One. There's been an explosion; we're missing part of the left wing. We are going down." Muffled by the headphones the president had tuned to the cockpit, the pilot's voice cracked with stress. Strapped into his seat, surrounded by his Secret Service detail, President John Glenn knew the end was near. In the midst of the crisis, he was still struck by the irony. A decorated combat pilot, veteran of two wars, the first man to orbit the Earth -- and he was about to die in what should be the safest passenger aircraft in the known world. Annie, who had supported him through all the dangerous undertakings, would be widowed by an accident that should never happen. Time slowed, stretching like summer taffy. Each second felt like minutes, as the presidential jet continued its plunge through the banked clouds, hurtling toward the unseen ground below. Around him, people moved in slow motion. Shouted orders became a deep hum, as voices slowed and time stood still. Glenn glanced quickly around, looking for any sign of movement. Everyone was frozen in place in the dim cabin lights. Everyone but him. Obeying the reflexes that had saved him so many times before, he tore off the passenger restraints and started toward the cockpit. From behind him, a flash of golden light bathed the dim cabin. For an instant, it reminded him of the firefly-like lights he had seen on his first space flight. Then the light faded, leaving the cabin in shadows. "That won't save you this time, Colonel." He whirled around, toward the sound of the voice. There was a man, a stranger, behind him. Glenn blinked, trying to focus on the man, but he couldn't see him clearly. The cabin light was low, and it was as though he were shrouded in fog, inside the plane. "Who are you?" Glenn demanded. "I can't see you. How could I know?" He wasn't afraid, but this stranger was damned annoying, and he had much more important things to do than stand around arguing with some guy in a fog bank. He could save this plane, if he could just get to the controls in time. He knew he could. "Yeah, you can save them," the man said, as though Glenn had spoken his thoughts aloud. "But not in the way you think." "Who I am isn't important. You can call me your guardian, if you need a label. It's who you are that matters." He gestured toward the empty seat. "Might as well sit back down, Colonel. No one is going anywhere for a while yet." The fog slipped lower, as the guardian settled into a seat across the aisle from the empty seat. "I know who I am. I'm the President of the United States. And I have my people to protect." "Sit down." It was a command this time, in exactly the tone to activate the retired colonel's military training. He sat, assuming the rigid military posture that had been a part of him for so long. "At ease, Colonel." The guardian waved a hand - he thought it was a hand - at him. "I told you, we aren't going anywhere." It was true, the plane wasn't going anywhere, though it should have augered in by now. Instead, it hung inside a cloud, defying the law of gravity. "Like my name, what I want isn't important. The question is, what do you want?" Over the years, Glenn had learned the hard lesson of waiting out a question he did not want to answer. He sat ramrod-straight, and stared at the shifting cloud. The heater fans hummed, sending warm air swirling through the cabin, but the cloud around the guardian remained undisturbed. After a moment, the guardian continued. "Haven't you ever wondered how you managed to survive all the missions, all the dangers, you've faced over the years? You flew combat in two wars. You flew untested planes. You survived that first orbital flight, when everyone thought you might burn up on reentry. Did you think you were just lucky?" Mission Control was hushed, as the 11th scheduled launch approached. After months of delays and reschedules, they were finally going to send a man into orbit. Finally, with multiple orbits, they would be back in the space race. Unless the launch got scrubbed again. From the capsule, Glenn was patched through to his Annie, at home in Arlington. Hearing her voice made his chest tight. He tried to reassure her. "Hey, honey, don't be scared. Remember, I'm just going down to the corner store to get a pack of gum." "Don't be long," she answered. His voice caught as he said, "I love you." He was glad no one could see his eyes at that moment. Glenn heard Flight Director Chris Kraft call a hold, with less than ten minutes to go. It was the second in under thirty minutes. The Bermuda tracking station was having trouble with their radar. They had come so close this time. He was in the capsule, ready to launch. Would today be just another delay? The silent seconds ticked by. For two long minutes, everyone waited for a decision. Finally John Hodge in Bermuda said, "We're go." Familiar voices went through the procedures they had drilled on for months. Today it was for real. He waited, listening, hardly daring to believe it would finally happen. At eighteen seconds the countdown went to automatic. For the first time, he knew he was going to fly into space. Seconds later, the engines roared to life, the holddown clamps released, and the giant rocket slowly lifted off the pad. Later, someone would play the film of the launch, and he would hear the one thing he couldn't hear from the capsule. In the launch blockhouse, Capsule Communications - Capcom - was Scott Carpenter. As the rockets fired, he said, "Godspeed, John Glenn." The flight of Friendship 7 was etched in Glenn's memory. The glory of the first sunset, the sudden blinding brilliance of sunrise. The fireflies, a swirling cloud of glowing golden lights around the cabin, which no one had ever explained to his satisfaction. There were other memories. Problems with the automatic attitude control. His irritation when flight control wouldn't voice their fears about the heat shield. The searing heat of reentry, not knowing whether the heat shield was intact. Wondering if the capsule would withstand the next minute. The elation when the chute blossomed over him. Everything had worked the way it was supposed to. Or was there more to it? The plane remained frozen in midair, as the guardian waited for an answer. Glenn shook his head. He was grateful for the faith that sustained him in times of peril, and for his good fortune. But he had never questioned its source. "The big guy likes you, man! Haven't you figured that out by now? Think about it. The flight controller says, "Godspeed, John Glenn." That pack stays in place, and you drop into the ocean, pretty as you please." "I didn't even hear him," Glenn replied. "It doesn't matter whether you heard him or not. He said it. That wasn't the last time, either. Every time something went wrong, every time you were in danger, somebody remembered the magic words, and you came back safe. It was a ritual with your regular ground crew, something the chief mechanic repeated on every Air Force One flight. They had left the ground ahead of schedule, before the arrival of the regular crew. They were anxious to reach the Space Center in Florida, where the stunned NASA engineers and astronauts were trying to make sense of this morning's horrifying explosion. As Air Force One climbed away from Andrews Air Force Base, Glenn had watched the capital pass out of sight behind them. He was one of the staunchest supporters of the space program, and he worried about the opposition the program would face when he returned. Then he dismissed consideration of the long-term problem, and focused on the next few hours. The grieving families of the victims would be waiting in Florida, waiting for comfort from their president. It was ironic that he would be the one. It could so easily have been another president, offering the meager comfort to Annie and his family. He knew, perhaps more than anyone, that it could never be enough. He hoped he could make them understand how important the program was, to the country and to the individuals who had given their lives for it. He believed in a life of service, and the brave men and women of Challenger has believed it, too. He prayed that their families shared that belief, as Annie and David and Lyn did his. "Do you mean--?" Glenn hesitated, hope rising within him. "You can't change what happened this morning," the guardian answered. "Disaster is going to bring down Challenger, no matter what you decide, Colonel. But you can change what's coming. Not this year, and maybe not the next, but soon. "They'll send up another shuttle, and lose another crew. Discovery. A little thing, really. An access hatch blows off at launch, and damages an engine. But, like I said, the big guy likes you. He'll bring you home safe. "But if you're not there, that disaster will end manned spaceflight." The thought sickened Glenn. The work, the sacrifices, the lives given up for the program. It couldn't end this way. "Back? Back to where?" He looked around. There wasn't anywhere to go, except down - to meet the ground and end in a ball of flame. "Not where. When. Go back and take a different path. Not the one that leads to the White House, but the one that dead-ends in the Senate." Super Tuesday hadn't been very super for the Senator from Ohio. Beaten in the primaries and caucuses across the country, he faced the inevitable with his usual remarkable calm. This wasn't his first disappointment, nor, perhaps, his greatest. Alan Shepard had beaten him into space. He had been forced out of the 1964 Senate race by an injury. He had lost the 1970 Senate race to Metzenbaum. He didn't lead a charmed life, not by a long shot. But he had gained more than he had lost. He still had Annie, his kids, and his honor. He wouldn't trade any of them for anything, including the White House. When his Senate staff assembled, he played a popular song for them. They listened, as Kenny Rogers sang about the gambler, "You've got to know when to fold 'em." With his head high and his shoulders back, he maintained his dignity in the face of defeat. He announced his withdrawal from the race at a press conference in a Senate caucus room, declaring, "Although my campaign for the presidency will end, my campaign for a better America will continue." Glenn was confused by the memory that wasn't his. He had done well on Super Tuesday, giving him the boost that earned him the nomination and the White House. Glenn stared at the guardian. They were about to smash into the ground at terminal velocity, and this guy was telling him he could go back in time and change things? He had never had a hallucination in his life, even when he had truly gone where no man had gone before. But maybe he wasn't able to accept the end of his life, and this apparition was his way of blocking it out. "You're not crazy," the guardian said, once again hearing Glenn's unspoken thoughts. "This is real, and the choice is yours. "Go back. Make a difference. Ride the rocket again. You're the biggest hero NASA's got; they'll find a way to let you go. And when someone says 'Godspeed, John Glenn' - and they will - you'll all come back down as smooth as can be. You can save that crew, Colonel. The space program will have a hero again, even if no one knows exactly what it cost you." "There's got to be a catch..."
"You won't be in the White House. You will have political trouble, and you'll never get farther than the Senate. That enough of a catch for you?" "But I will always know I could have." "Nope. Doesn't work that way. Once you go back, this never happened. You won't be able to tell anyone, because you won't remember. "Or you can go up to that cockpit and try to bring this plane down safely. You're missing half a wing, and even you can't overcome that, but you're free to try." The fog swirled, as though the guardian had shrugged inside his cloud. "Who knows? You may make it, if you can suspend a few laws of physics." For a moment, he dared to hope. Maybe he could overcome the damage. But the program, the research and exploration that he had given his life to, that he believed in, would be doomed. And six good people, people who shared his love and dedication to the space program, would die. The images of the exploding shuttle were indelibly etched in the minds of every citizen. The scene had been replayed endlessly, as a stunned nation watched, unable to fully accept the disaster in the clear Florida sky. Within minutes, questions were being asked both in Mission Control and around the world. How could this happen? What was the cause? The future of manned space flight hung on the answers to those questions. For now, no more Americans would fly in space. A delegation from the nation's capital was quickly assembled and shuttled to Andrews Air Force Base, where they would depart for Florida. A detail of Marines watched as Air Force Two took off, carrying the Vice President to Cape Canaveral. Aboard the plane was one of their own. As the jet turned south, one young Marine said softly, "Godspeed, John Glenn." "Is that where I'll be, if I go back?" "Yeah. Same airspace, different plane, different companions. And a different future." Compared to the loss of manned flight, personal ambition was a petty concern. There were things he could change, and things he couldn't. He hoped he had the wisdom to know the difference. Daniel Goldin, Chief Administrator, NASA: "When someone who has risked their life countless times for a space program and for our country comes to you and says, 'I'm willing to take the risk of space flight and serve my country again, because I think we can do more to benefit the lives of older Americans, can I go?' you don't say no. I am extremely proud to announce that John Glenn of Ohio, the first American to orbit the earth, will get his long-awaited and much-deserved second flight." Glenn could feel a lump in his throat when he considered the possibility of being allowed to fly again. It was a dream he had given up long ago, an ambition for a younger man. "Will they really let me go?" "They will need you, more than any of you will know." Hope bubbled in his chest. The prospect made him light-headed with joy. "And can I make a difference?" The cloud moved slowly, as though the guardian were shaking his head. His voice was somber when he replied. "Yes, you can make a difference, for that mission. There will be others, ones you can't change. One person can only do so much, you know, no matter how much the big guy likes him. "But you can save Discovery, and you can save the people on this flight." Glenn took a look around. His Secret Service detail had been with him since the campaign. He knew their wives and children. He knew the press secretary and two speech writers who were working in the conference room, even though he couldn't see them. One of the speech writers had just moved her ailing mother into her home, where she could care for her. For each of these people, he could make a difference. If he could believe what the guardian was telling him. "It's the truth," the guardian said. "Or at least a possible truth. If you choose that path." The T-38 rolled to a stop on the tarmac at Cape Canaveral. Beside it were four identical planes. Although he was sitting in the second seat, John Glenn was once again flying a jet plane, and preparing for a flight aboard the shuttle Discovery. The guardian seemed to grow impatient, his tone sharp as he asked again, "What do you want, Colonel? Do you need to see more?" Glenn hesitated. Hope swelled within him, a dream rekindled by the images the guardian had shown him. Was that hope clouding his judgment? Perhaps he could do more to protect the program from the White House than he could from the flight deck of the shuttle. He wished he could talk to Annie. For forty-three years she had been the best advisor, the strongest supporter, he had ever had. "This is your decision, Colonel." The day dawned bright and clear. It was as if Mother Nature herself had given her blessing for the launch. But it takes more than good weather to make a safe flight. The countdown droned on, each second ticking over as each member of the huge team performed their assigned duties. Standing on the pad, the flight crew looked up at the rocket that would carry them into space. They were tiny orange specks against the massive machine, a few hundred pounds of bone and flesh facing a four-and-a-half-million-pound behemoth with a million moving parts. With five minutes to go, the countdown stopped. Two small planes had entered the airspace near the Cape, and would have to be removed. Finally, the last few minutes ticked away and the engines lit. In Mission Control Scott Carpenter repeated the magic words. Glenn considered his choices. The cloud stirred impatiently. "You said no one could help me decide," Glenn said, his voice slow. There was one thing he had noticed. "But you have not addressed me once as 'President,' only as 'Colonel.'" The guardian was suddenly still, impatience turning to wariness. As Glenn suspected, the observation had been not only accurate, but significant. He had his answer to the last unspoken question. "Send me back." As soon as the words left his mouth, he knew, all the way to his bones, he had made the right decision. The cloud stirred and Glenn thought he saw the guardian nod. "You got it." The light faded around him. He was dropping, weightless, through time and space. As the darkness overtook him, he looked back. The guardian's cloud had become a swirl of tiny fireflies, just like the ones he had seen surrounding Friendship 7 on his first flight. The cloud passed through the bulkhead, swarming around the plane as they emerged into the darkness. Before they vanished completely, he heard the guardian say softly, "Godspeed, John Glenn." 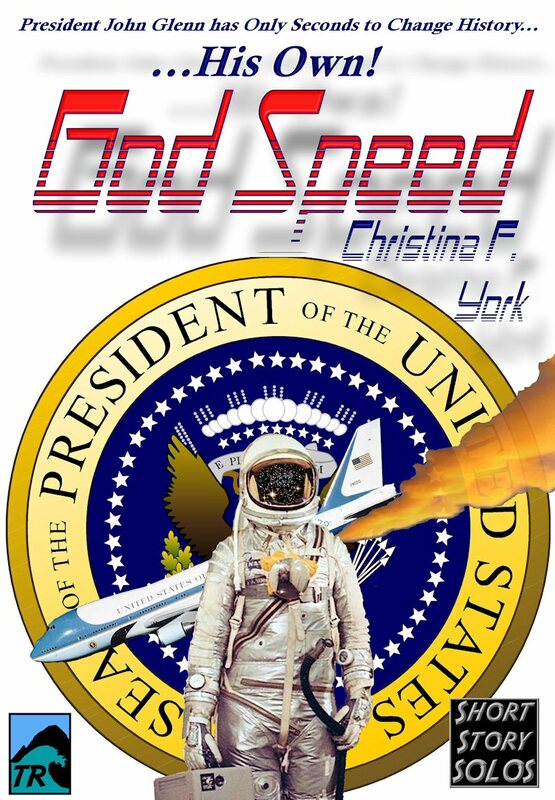 Godspeed by Christina F. York first published in Time After Time, edited by Denise Little, DAW Books, 2005. Christina F. York remembers both of Glenn's spaceflights, and considers him a true hero. A native of the Pacific Northwest, Christina writes across several genres, including SF, fantasy, romance, and mystery, sometimes in collaboration with husband J. Steven York. 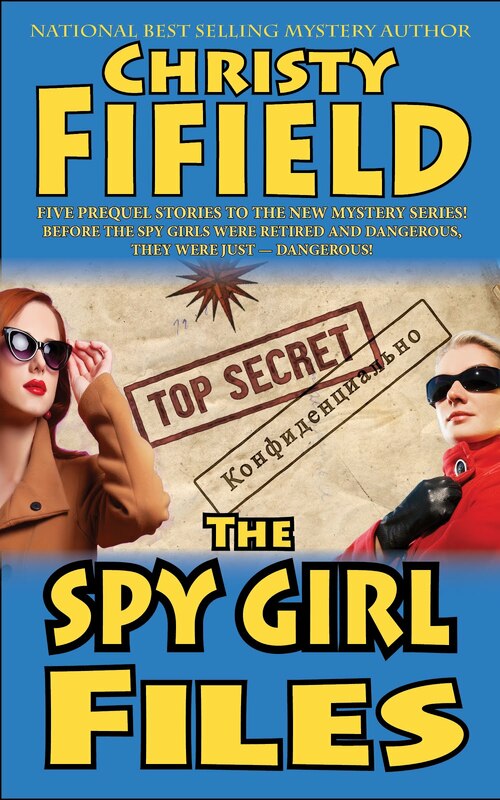 Her mystery novels are published as Christy Evans, and Christy Fifield. 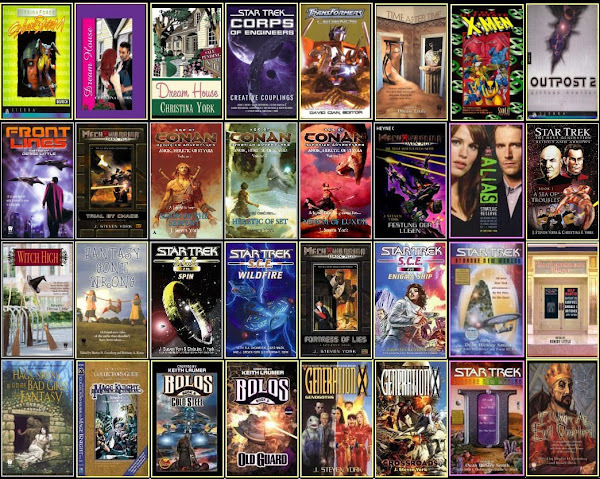 Look for more fiction from Christina at Tsunami Ridge Publishing, or wherever books are sold.